-- Please Select --SEA DIAL Mask Strap™ Black Strap SEA DIAL Mask Strap™ Clear Strap NEOPRENE Clamshell Mask Strap (6mm total thickness)! The SEASOFT DELTA FORCE Super Mask™ is an extremely lightweight frameless single lens mask design that is coveted and used by the US military, law enforcement and other elite armed forces around the world. Your underwater vision is exceptional with the DELTA FORCE Super Mask's™ ULTRA CLEAR HGG Glass™ and the Crystal ARC™ multiple metal oxide coatings, the same type of coatings found on precision riflescopes. What are ULTRA CLEAR HGG Glass™ and Crystal ARC™ lenses? All of SEASOFT's Super Masks have ULTRA CLEAR HGG Glass and Crystal ARC™ lenses for unsurpassed vision, especially in low viz situations. ULTRA CLEAR HGG Glass™ is a special type of glass that has very little impurities and has had virtually all of the remaining impurities removed, specifically iron. When you look closely at most glass it has a slightly greenish tint, iron gives glass this "green" tint. SEASOFT uses a special glass made from sand from North Africa known for its low iron content. When you eliminate the impurities, you reduce the reflective properties of the glass which improves its ability to transport light to your eyes. Crystal ARC™ stands for Anti-Reflective Coatings. These numerous microscopically thin layers of metal oxides reduce the light that is reflected away from the diving lens. This is important because what we see is carried by light. The less light entering the mask, the less we are seeing, especially in low light, night diving, and in low viz dives. In a normal dive mask with "float" glass (green tinted glass) and without Crystal ARC™ lenses, approximately 84% of the light is reaching the divers eyes. In a SEASOFT Super Mask, up to 98% of the light is reaching your eyes! When would I notice the difference with the ULTRA CLEAR HGG™ Glass and Crystal ARC™ lenses? Is it worth paying the extra money? If you were out hunting or taking pictures of big whitetail deer and it was a beautiful autumn morning, clear skies, and that big buck is standing still silouetted a stones throw away you can use virtually any riflescope or telephoto lens. It'll do the job. But if it is early in the morning at first light with a rolling fog and a falling mist you really would want the best, right? Well, when you night dive or you have that dive with terrible vis, you are going to be blown away by how incredible you can still see in those conditions. Is it worth the money? On that dive - worth every penny! Is the DELTA FORCE Super Mask™ comfortable, a lot of masks hurt my face after a while? 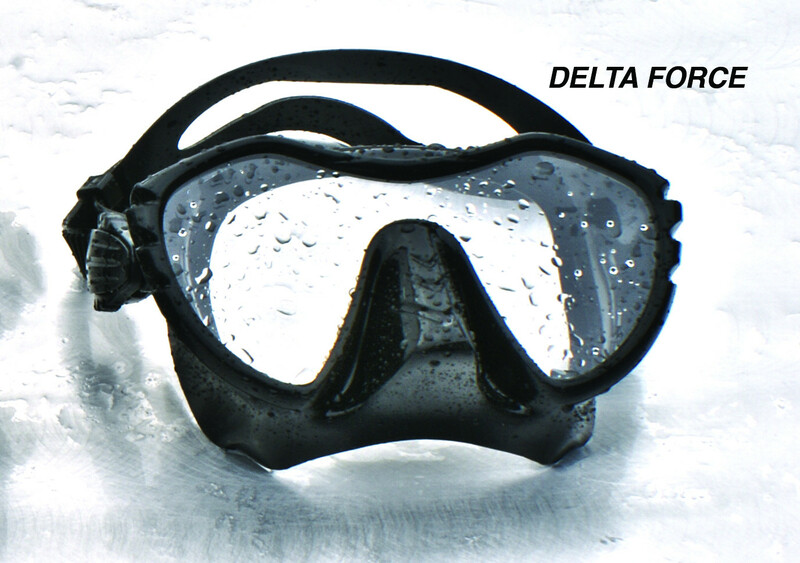 The DELTA FORCE Super Mask™ has been manufactured with SEASOFT's amazing FITZ™ full liquid crystal silicone design, with its flarable skirt that delivers an unsurpassed comfortable, watertight fit on medium-large to extra-large faces. There is no higher quality silicone available anywhere in the world. SEASOFT always uses the very best when it makes a product. What comes with my DELTA FORCE Super Mask™? 1. A FREE SEASOFT LIFETIME BREAKAGE WARRANTY, this includes GLASS BREAKAGE, see the warranty section on this website or on the last page of our catalog. 2. A FREE SEASOFT Deluxe Soft Case with separate compartment for an anti-fog - valued at $19.99. 3. A FREE SEASOFT 2 oz. SEAVUE Anti-fog Spray engineered to be used with ULTRA CLEAR HGG™ Glass and Crystal ARC™ lenses - valued at $7.99. 4. A FREE SEASOFT neoprene "clamshell" adjustable mask strap - valued at $14.99. What is the difference between a "frameless" mask like the DELTA FORCE and a "framed mask"? A "framed" mask has an external frame with the lenses mounted inside the frame and the skirt is then attached to the outside edges of the frame. As is often the case, a name catches on that is not quite accurate. All masks must have some type of frame or what would hold the lens in place? What the name "frameless" is trying to imply is that the frame is actually internally "wrapped". In other words, the single lens is mounted in the frame and then the enlarged skirt, with the mask strap adjustors already molded into the skirt, is completely wrapped around the frame. This makes the mask appear as if the frame is inside the skirt or "visible" or "frameless". The benefits of a "frameless" mask is its lower profile and light weight; yet still very strong and durable because the single lens gives the mask a great deal of strength and rigidity. If the DELTA FORCE Super Mask™ already comes with a neoprene "clamshell" mask strap why do you recommend the SEA DIAL™ Mask Strap? 1. When you need to tighten your mask strap it is sometimes maddenly impossible to enen FIND the end of the mask strap in order t pull it tighter. 2. When you do pull it - you often pull it too tight. 3. It is difficult to get any mask strap to pull and pivot evenly on the back of your head or hood. This can often lead to a really uncomfortable mask!!! 4. It is difficult to put and/or keep most mask straps on your head or hood. 5. Often a mask strap will "pull" too much from the top or bottom creating leaks either in the bottom or top. This is often because it is difficult to place the mask strap squarely and evenly behind your head. 1. A dial that tightens your mask in 1/4" increments for the perfect tension! 2. A wide base with a non-slip base that fits comfortly against your head without getting tangled in your hair or equally well against your hood without any slippage. 3. The dial reverses to loosen your strap. 4. Completely even tension from all angles on your face so that the comfort is extraordinary! Do you have to prepare the DELTA FORCE Super Mask or its lenses before you dive them? Yes, but there are clear instructions on how to prepare your mask and lenses for diving on an accompanying link in this same MASK section on the www.seasoftscuba.com website. Please do not dive your new mask without reading this section! In summary, the DELTA FORCE Super Mask™ is one of the best masks in the world and we think you will treasure it for years to come. We don't think anyone will complain about the fit or performance of this mask. Already in use by many active and retired military divers, this just might be the perfect mask for them and you! • SEASOFT's LIFETIME BREAKAGE WARRANTY; if it breaks, it’s replaced.